Nathan Straus walked into R. H. Macy’s with a couple of samples tucked under his arms. The year was 1874 and Nathan was representing the firm of L. Straus & Sons. Nathan had a one-of-a-kind proposal for Mr. Macy. “With a recession under way, Rowland Macy decided it was his kind of deal. He promptly offered the Strauses 2,500 square feet of prime selling space – in the basement. The following March , L. Straus & Sons opened a china department chockablock with plates, saucers, tureens, cut-glass vases, majolica, and glassware of every conceivable size and description. Within a few months, they advertised that theirs was the ‘most extensive assortment’ of its kind ever displayed in America. The brothers knew what they were doing, too, because their area became the most popular in the store. Thus began the connection of two great firms. R. H. Macy & Co. was well on its way to becoming a powerhouse in the retailing field. L. Straus and Sons was rapidly becoming one of the largest importing firms in the country. Like with so many other companies, the early records have been destroyed. Therefore, the story of how Macy’s and L. Straus & Sons entered the cut glass business has been woven together from articles in the trade papers, Macy and Straus ads and Macy catalogs. Who were the men behind these two great companies and how did they get started? The December 19, 1912 Crockery and Glass Journal provides the answer. The article is reproduced in its entirety and illustrations have been added for emphasis. 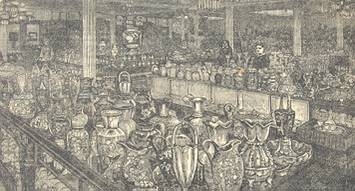 Caption: A partial view of the Fine China, Glass and Bronze Department as it appeared in 1882. When R. H. Macy opened the store in 1858 he adopted four principles which were an innovation at that time. They were fixed prices and no discounts to any one; odd prices, such as 9 cents, 14 cents, and so fourth, absolute cash selling and no credit to any one, and prices which were as low and lower than the prices in other stores, even after the haggling which invariably preceded purchasing in those days. It was on these principles that the house of R. H. Macy & Co. grew. Through the years of evolution from 1858 to the present day Macy’s adhered to its principles of integrity. The proprietors saw the city spreading, saw the transition of transportation from the old bobtail horse cars and rattling omnibuses to the cable car and elevated trains drawn by queer humpbacked little locomotives. They saw the realization of an age of rapid locomotion and observed other manifestations of sudden expansion of the great city. Messrs. Isidor and Nathan Straus, with their father foresaw the beginning of the inevitable trend towards the north, and toward the close of the century prepared for the change little thinking that they were to make a move that would revolutionize the entire shopping system of the city, established new activities for business houses, office buildings, banks and hotels and swing the social center of the metropolis. They figured the new methods of transportation, saw that where Broadway and Sixth avenue crossed was fast becoming the most congested point in the city, and in May, 1901, announced their faith in the future of the locality by making public plans for a magnificent nine story building. Rowland H. Macy was born in Nantucket, Mass, August 29, 1822. After receiving a common school education and when fifteen years old he followed the bent of many other Nantucket boys and went out on a whaling voyage. Three or fours years at sea were enough to dispel any delusion of fame in that direction and he set out in the world to seek his fortune. He was an apprentice at nothing, but a master of determination, bright and enterprising. He went to Boston. There about the year 1845 he became acquainted with George W. Houghton, an importer, who seemed to take a fancy to him. Miss Houghton, the importer’s sister, fell in love with the energetic youth and married him. The bridegroom started a needle and thread store. This ran for five years with indifferent success. In its waning days the gold fever of 1849 swept the country. Mr. Macy went West. He became a grocer at Marysville, Cal., in the days of high boom prices, flourished for four years and then showed signs of losing. With about $3,000 which he had managed to save Mr. Macy came back East to open a store at Haverhill, Mass. Four years of bad business wrecked him. Once again he headed into the West, this time going to Superior City, at the head of Lake Superior, where he speculated in real estate. Unfortunately for him the whole country was prostrated by the panic of 1857 and Mr. Macy was swept away in an avalanche of adversity. With only a few dollars left he came to New York City and tempted fate once more in a little “general store” at 204 and 206 Sixth Avenue, just below Fourteenth Street. Caption: In this humble store at Sixth Avenue near Fourteenth Street, Rowland H. Macy opened for trade in 1858, and took in, as his first day’s business, $11.06 in cash; and the first over door of the Macy Store. The store was 17 feet wide and 40 feet long for a total of 680 square feet. The store was located between Thirteenth and Fourteenth Streets with Thirteenth Street on your right and Fourteenth Street on your left. Sixth Avenue is the Street with the horse drawn carriage. In 1868 it became necessary for Mr. Macy to buy the corner store, which he turned into a haberdashery. A year later a third store was purchased and a department of toys added. From that time on the remaining buildings in Sixth Avenue between Thirteenth and Fourteenth Streets were incorporated in the establishment, until it occupied the whole block front in the avenue and 150 feet in Thirteenth and Fourteenth streets. Other departments were opened fast, such as house furnishing goods, confectionery, soda water, books and stationery, boys’ clothing, ladies’ underwear made on the premises, crockery, glassware and silverware, dressmaking, dress goods, upholstery and, lastly, a restaurant for the women shoppers. 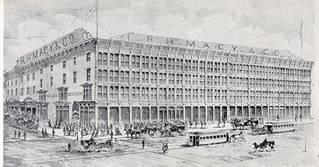 Caption: R. H. Macy & Co as it appeared in 1882. Mr. Macy continued as the sole impelling genius of the business until 1872, when he took into partnership A. T. LaForge, and in the year 1874 Robert M. Valentine was admitted, when the firm of R. H. Macy & Co. was incorporated. The business was the most extensive of its kind in the United States. It employed more than 1,000 persons and during the holidays from 2,000 to 3,000.